Cambro GBTPMD110 GoBag™ Medium Black Nylon Thermal Pad - 20 1/2" x 14" x 1 1/2"
When delivering food, you want customers to experience the same taste they would get if they were sitting in your restaurant. With Cambro GoBags, you can be sure that the quality and temperature of your food is well controlled to get the best possible product to your customers. Cambro begins with a high-density insulation made of recycled PET plastic that helps keep both hot and cold foods in safe temperature ranges. Then they add a black layer of vinyl on the interior for easy cleaning and temperature retention. The stitching is even reinforced to make sure you can transport your heavier foods without a problem. The exterior of the bag is made of 600 denier nylon for durability. The opening of the GoBags feature several hook and loop closures to securely seal each side of the bag. These fasteners are simple to use but make sure that the seal is tight for excellent reliability. 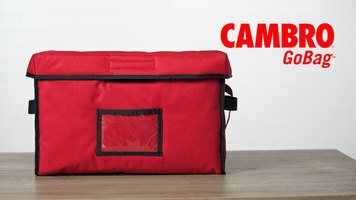 Cambro also added heavy-duty nylon straps. The straps keep the bag even and steady so none of your foods tip over while being transported. Each bag features a pocket so your employees can carry menus, coupons, condiments, and anything else they may need while on the go. Plus, GoBags feature a special clear ticket pouch that holds your tickets or receipts so orders won’t get misplaced or switched. Some bags can be easily folded flat for compact storage. Coming in nine different sizes, Cambro GoBags provide industry leading temperature retention as well as heavy duty durability. You can even personalize these bags by customizing any GoBag with your company name or logo! You can rely on these bags to get your food delivered safely and with the quality your customers have come to expect. Check out the video to discover all of the useful features of Cambro GoBags, a proven line of heavy-duty food delivery bags leading the way when it comes to versatility, durability, temperature performance, and customization! Keep your delivery bags at the ideal temperature for longer with this Cambro GBTPMD110 GoBag™ medium black nylon thermal pad! 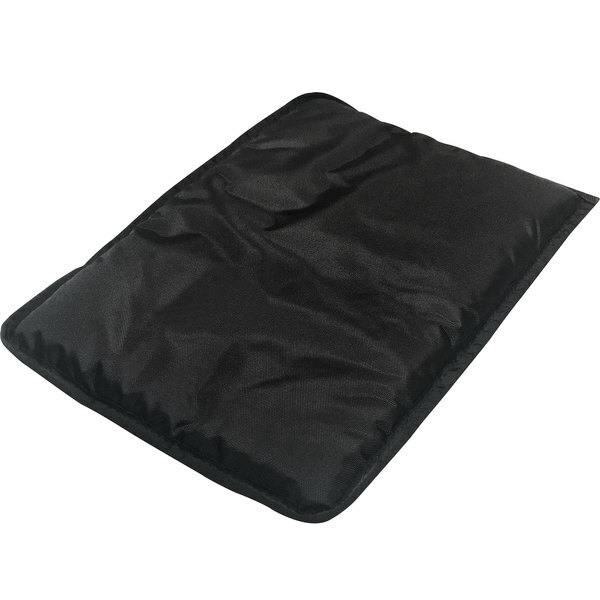 Perfect for your next delivery, outdoor gathering, or transportation to catered events, this thermal pad will help keep your beverages and food items at just the right temperature. This thermal pad's durable nylon construction helps maintain food's temperature, so you can worry less about the integrity of your signature meals. It can be used to separate hot and cold products in a single bag by forming an insulated barrier that keeps your cold products cold and hot products hot. For smaller orders, simply insert this thermal pad to reduce the space in your delivery bag to keep your food and drinks compact and less likely to spill or spoil. Additionally, the durable nylon material is built to last for reusable and daily use. This thermal pad's black color helps maintain a subtle look that fits in perfectly with any establishment. Thanks to the lightweight composure, this thermal pad is easy to transport to and from your kitchen for any event. Hold your business to a higher standard with this thermal pad!